The Loretto-Hilton Center for the Performing Arts – home to The Rep’s Mainstage and Studio Theatre productions – is located at 130 Edgar Road in Webster Groves, Missouri, on the campus of Webster University. Take interstate to I-44 or Highway 40 and follow directions above. * Off-site parking and free shuttle service available for Wednesday matinees. Parking lots J and K next to the theatre are reserved exclusively for subscribers and donors to The Rep and may be used for any performance, except Wednesday matinees. Access is from Big Bend Blvd., east of Edgar Road. Parking passes were sent with season tickets. Please present your parking passes upon entering the lots. Spaces in these lots are available on a first-come, first-served basis. 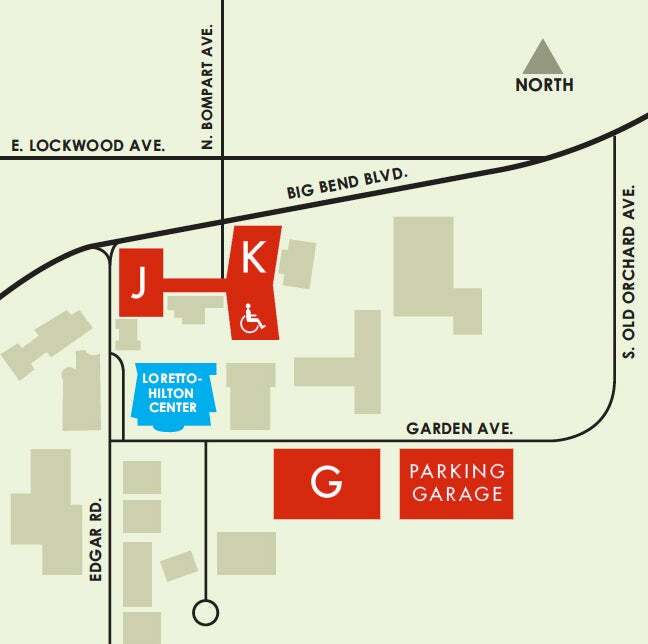 Additional free parking is available in the multi-level garage accessed from Garden Avenue. If you have any questions, please do not hesitate to call the Box Office at 314-968-4925. FREE parking is available in the Garden Avenue Parking Garage. Entrace is from Garden Avenue. $5 parking is available in Lot G.
For Wednesday matinee performances, parking is generally not available in any of the parking lots on campus because of Webster University classes. We strongly recommend Wednesday matinee patrons take advantage of our free off-site parking and shuttle bus service from Webster Groves Church of the Nazarene, located at 145 E. Old Watson, just two miles from The Rep. Shuttle service begins at noon and continues until 1:10 p.m. Return shuttles run continuously immediately following the performance and will accommodate patrons who wish to stay for post-performance discussions.